Prior to the hotel’s refurbishment in the 1990s, the current entrance hall of the hotel was occupied by the popular ‘Taverne’ that opened onto the boulevard. 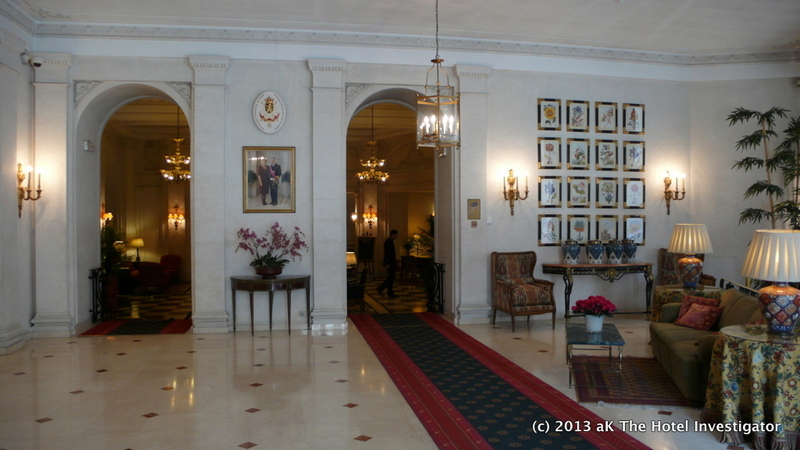 Today, a prominent spot above the picture of the Belgian Monarchs is occupied by the ‘royal warrant’ that the hotel was awarded (top middle). © Alex Kudla (aK) and 'The Hotel Investigator', 2012. Unauthorized use and/or duplication of this material without express and written permission from this blog’s author and/or owner is strictly prohibited. Excerpts and links may be used, provided that full and clear credit is given to Alex Kudla (aK) and 'The Hotel Investigator' with appropriate and specific direction to the original content.